Was about to make you guys guess what this is before I realised that I have already given the answer away in the title of this entry. This was taken a few Sundays ago outside my church and I thought I take a picture of this for posterity sake. Our kids will never know what this is in their life times. Heck, even some of my younger friends would not know either. 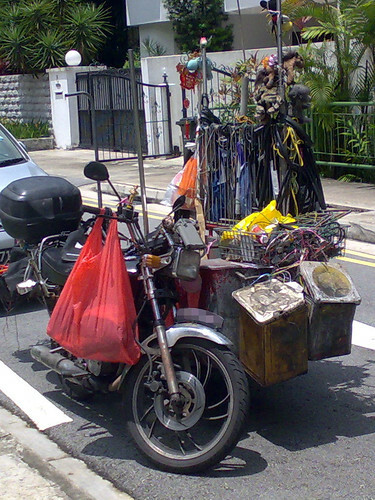 This is the motorcycle of a Karang Guni man with a side car for additional storage of stuff that is discarded by people. For those living in HDB flats, perhaps they are more familiar with the rag-n-bone man walking door to door and consolidating the items at the elevators and then move them all to the bigger lorry at the carpark. The motorcycle and side car is more geared towards landed property residences where mobility in the little lanes is essential and more cost effective than to have a lorry trudge the little streets.